Okay folks your favorite Polish Festival is coming up! 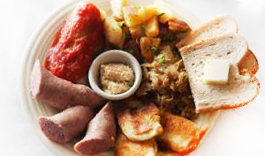 The St. Hyacinths’ Polish Picnic is Sunday, July 13th from 11 am till 6 pm, right here in the Finger Lakes. So get your Polka shoes dusted off. Get ready for some amazing Polish food: pierogis--dough with potato/cheese filling, kielbasa, kapusta--a traditional Polish food made with tasty sauerkraut, chopped cabbage, peas, mushrooms and pork, pigs in the blanket--cabbage leaves filled with rice/beef/pork, covered with tomatoes, and rye bread. Plenty of wine slushies, lemonade, and soda are available along with a beer tent. Plus there are delicious pizza fritte, and American foods: hot dogs, hamburgers, and French fries. And don’t forget there’s a tent with scrumptious baked goods. Wear a big hat to shade you from the sun. You can splurge on raffles—so much fun to bid on your favorite place to dine, a show, maybe a bike, or a basket of your favorite sports paraphernalia. There are so many choices for lucky winners along with the chuck-o-luck wheel, pull tabs, and the $1 money raffle. Drum roll…buy a raffle ticket to win a new car. Yup. There will be many winners. If you are the first place winner you get your choice of: a 2014 Chevy Cruze, a 2014 Ford Focus, a 2014 Chevy Spark with $4,000, or you can walk away with $17,000! Ten people will be winners—lots of cold hard cash will be given away. Your odds are pretty good and you’ll be supporting wonderful people who help wonderful people. The term wonderful is in honor of Father Gilbert. Fritz’s Polka Band will be back for the umpteenth time. They are famous in the Finger Lakes and in the world for being an amazing band. Even if you don’t get up to dance, I guarantee your foot will be tapping. Fritz’s Band will begin playing earlier, this year from noon till 6 pm. For children: there are free pony rides, a Bounce House, many kids’ games with prizes, and the Cayuga County Sherriff’s Safe Child Program will have a tent too. Mark it on your calendar. Plan to enjoy a wonderful Polka Band, amazing Polish and American food, lots of fun things to do, all right here in the Finger Lakes region. The festival will be held behind the church at 59 Pulaski Street, Auburn, NY.